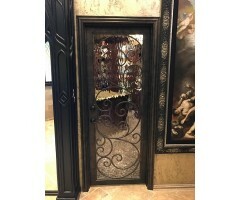 This pantry room door consists of scrolls and collars to create the pleasing design, backed with textured glass. .. Interior full floor to ceiling French Doors framed in scrolls offer a beautiful architectural feature to the home, while also providing security and light for this home office. .. 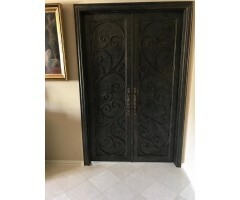 This double interior door boasts obscure glass with top to bottom scrolls creating an elegant boundary to your home office, or any room you'd like to set apart with style. .. 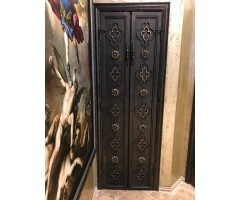 Continual full sweeping large scroll design is visually artistic, and compliments all styles of decor. .. 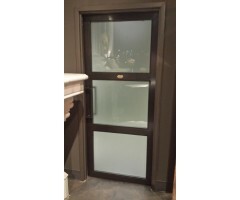 Double Interior Door with obscure glass and iron components laid out to please the eye, and create an artistic architectural feature adding immediate value and interest to your home. ..